Our established and continually growing medical practice is hiring an experienced Medical Assistant to support one of our Surgeons and patients. This position is primarily back office patient care. Our Doctor is a leader in his specialty both locally and nationally. We are hiring a self-motivated and dedicated Medical Assistant to join our work family, to be a part of our success, ongoing growth and commitment to the best possible patient care. The practice is centrally located in San Diego, CA. We have easy freeway access and plenty of free parking. Medical Assistant with 2 or more years of recent work experience as a Medical Assistant in a private practice or clinic. Experience with rooming patients, taking vital signs, updating charts using EMR. Computers skills and accurate keyboarding for charting and scheduling using EMR. Knowledge and experience with patient medical insurance plans, referrals, insurance verifications and authorizations helpful. Take phone calls for Doctor, triage calls, take messages and schedule appointments. Check insurance coverage before referring patient for tests as ordered by Doctor. The rate of pay is $16.00 – 18.00 hr. to start. Do you have a favorite social media site? 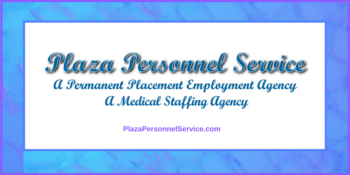 Plaza Personnel Service is on Facebook, Pinterest, Twitter, Yelp, LinkedIn, YouTube, Instagram Check us out on your social media site.